Why are My Teeth Changing Colors? Unfortunately, tooth discoloration is a natural occurrence as you age. However, the severity of the discoloration depends on multiple factors. There are various things that contribute to the rate of tooth discoloration, such as lifestyle choices, foods, and medical conditions. As your teeth discolor and lose their bright white appearance, your confidence can begin to dim along with your teeth. Thankfully, your dentist can provide teeth whitening in Sapulpa. With professional teeth whitening in Glenpool and Sapulpa, you’ll restore your smile’s bright white appearance while making your smile appear younger. Tooth discoloration can take many forms. While many people think discoloration only involves the teeth turning yellow, your teeth can also turn brown and even gray. Discoloration can also occur on only select spots, instead of the entire tooth as a whole. The color and area of your discoloration says a lot about the cause behind the tooth changing colors. Extrinsic staining is due to certain lifestyle factors and occurs on the outside of the tooth. The foods and drinks you consume cause this type of staining as the stain-causing particles seep into the enamel and become trapped underneath the enamel layer of the tooth. Tobacco and poor oral hygiene also cause extrinsic staining. You can also experience intrinsic staining, which is caused by factors we aren’t often able to control. For example, the use of certain drugs and medications, like antibiotics and tetracycline, can cause your teeth to become discolored. Trauma to the teeth can cause the enamel to darken, while certain dental treatments can cause discoloration too. Dental fillings can eventually cause dark spots to develop on the teeth, especially when amalgam fillings are used. In some cases, using too much fluoride can cause discoloration. While fluoride is needed for strong healthy teeth, too much fluoride can cause white lines to appear on the teeth. The discoloration you experience is also linked to your age and genetics. 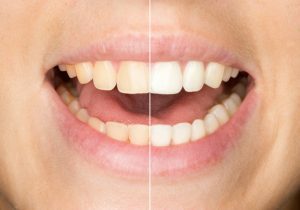 No matter the cause of your discoloration, as your dentist in Sapulpa OK, we offer the whitening treatments you need for a bright smile. We offer multiple whitening treatments to restore your beautiful smile. Our in-office teeth whitening will whiten yellow, stained, and discolored teeth using a safe and effective whitening solution. Using the latest bleaching technology, we will drastically improve the appearance of your smile. We also offer Sapphire Teeth Whitening, which is a fast and effective whitening treatment. We can whiten your teeth by up to 10 shades in under an hour using a specially formulated whitening gel. Or, if you prefer to whiten your teeth at home, we also offer at-home teeth whitening. Using custom-made cosmetic trays and professional-grade whitening gel, you’ll see the results you want in just a few days. If tooth discoloration is causing your confidence and smile to dull, it’s time to take action with professional teeth whitening in Sapulpa and Jenks. Our whitening treatments will reverse the signs of discoloration for a brighter smile you’ll love to show off. Comments Off on Why are My Teeth Changing Colors?